Minister for Communications and Works, Honourable Mark Vanterpool, in his remarks declared that ownership of the Cruise Pier belongs to the people of the Virgin Islands. Managing Director for the BVI Ports Authority, Mr. Claude Skelton Cline, welcomed Virgin Islanders to the future and explained what the construction of the projects means. 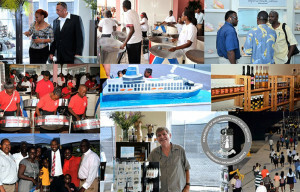 “For us at the BVI Ports Authority we were not just building buildings, we were constructing a future. For us this is not about bricks and mortar, this is our future,” Mr. Cline said. Local vendors, musicians, dancers, royalty and Virgin Islanders from all four corners of the Territory gathered to become one on the auspicious and festive occasion. Earlier in the day, tourists were greeted by the BVI Ultimate Sky Dancers (Mocko Jumbies) at Craft Alive and the steel pan music played throughout the day. Phase I of the Cruise Pier Expansion is now complete and many local contractors and sub-contractors have benefitted and will continue to benefit from the project as Phase II, Tortola Pier Park, progresses.